After a short drive down the Benjamin Franklin Parkway we found a place to park that was closer to our final few destinations. We took a little side trip to Logan Square and walked around the Swann Memorial Fountain. By this time of day the temperature was in the mid seventies and we were just taking some time to enjoy the day outside. There was actually a Polish-American parade taking place so we stood around and watched it pass us by for a little bit. Once we had our fill we headed to one of my all time favorite types of museums. 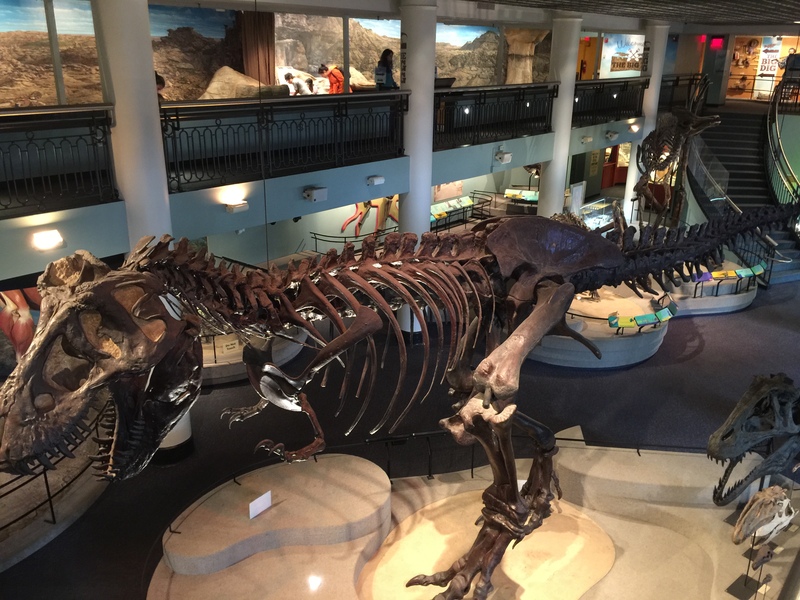 The Academy of Natural Sciences of Drexel University is the full title. What can I say I’ve been fascinated with Dinosaurs since I was a kid. 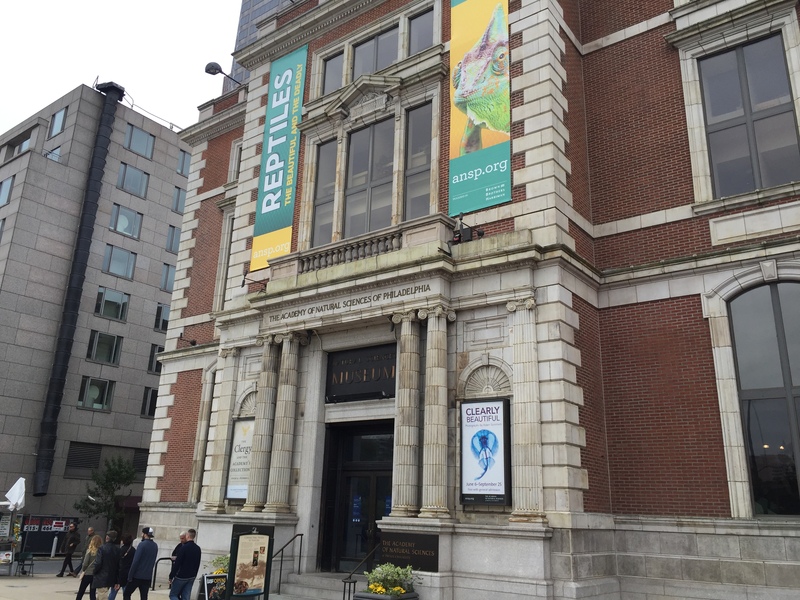 This is listed as being the older Natural Science Museum in the world, it was founded way back in 1812. We headed inside, paid our admission and started at the top floor so we could work our way back down. 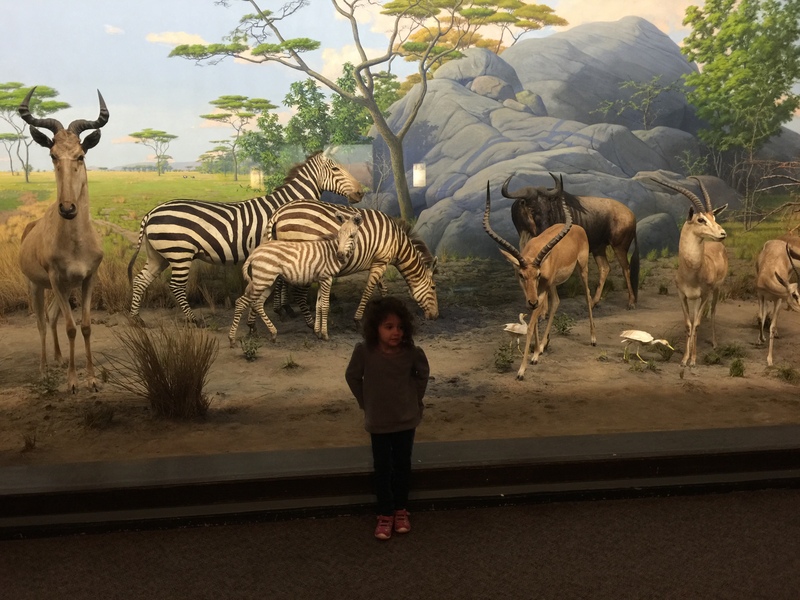 They have 37 dioramas for viewing which are simply three-dimensional displays showing a wide variety of animals in their natural settings. Back in the 1930’s and 40’s when most of these dioramas were first installed they provided generations of museum goers their only opportunity to experience distant places and exotic wildlife. The only tip I would really give to anyone visiting this museum is to make sure you take a map from the admission desk. There are some areas that you can only access by a specific elevator or staircase. I’m always more of a fan when the layout flows more naturally and takes you through each area without having to backtrack. We did find ourselves viewing the same areas a few different times when we tried to get from one area to another, but eventually we figured it out. Saving the best for last we headed to the Mezzanine that gave a very cool overview of the Dinosaur Fossil area. Up on the Mezzanine there were some interactive exhibits that Hanna had fun with. We walked to the far side and came down the stairs so we were face to face with the Dino’s which I don’t think Hanna realized just how big they actually were. 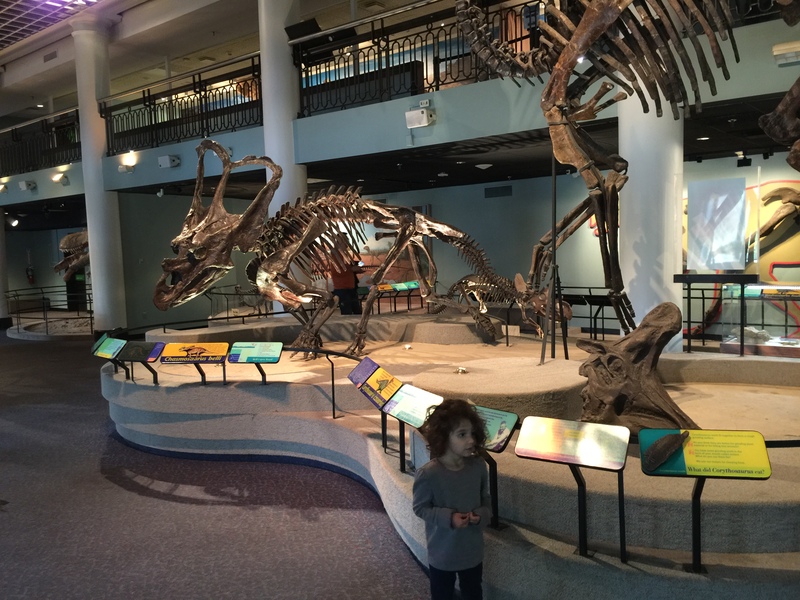 She seemed didn’t mind the stationary fossils as much but there were a few that were animated and made some loud noises that she wasn’t a fan of. 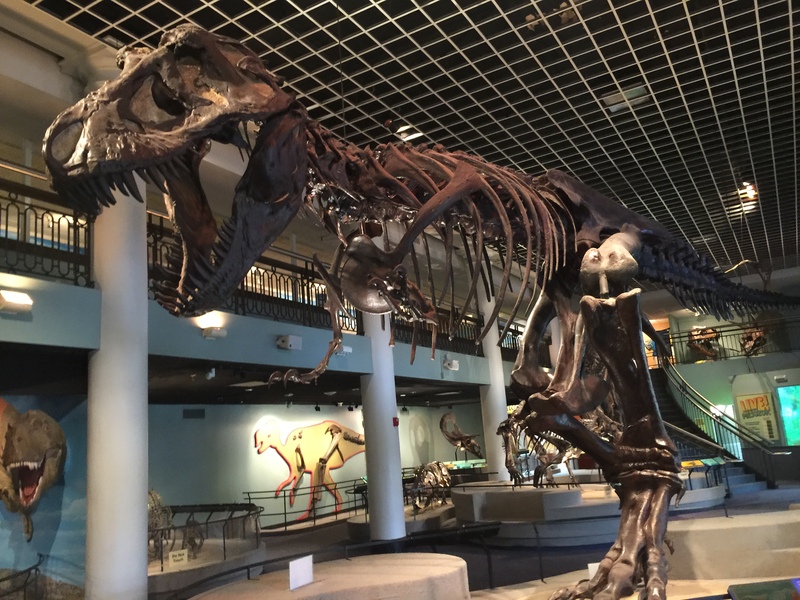 We avoided those but enjoyed looking at the all different types of dinosaurs and of course we had to take a closer look at the T-Rex. We headed back out towards the main entrance and headed into the gift shop. Hanna wasn’t interested in any souvenirs so we headed just outside the store and found the penny machine. This was another machine I had collected years ago. The designs were still the same but the signage on the machine had been updated. All four designs said “The Academy of Natural Sciences” and included images of: A Polar Bear, The T-Rex Fossil, a Butterfly, and a Cannon. 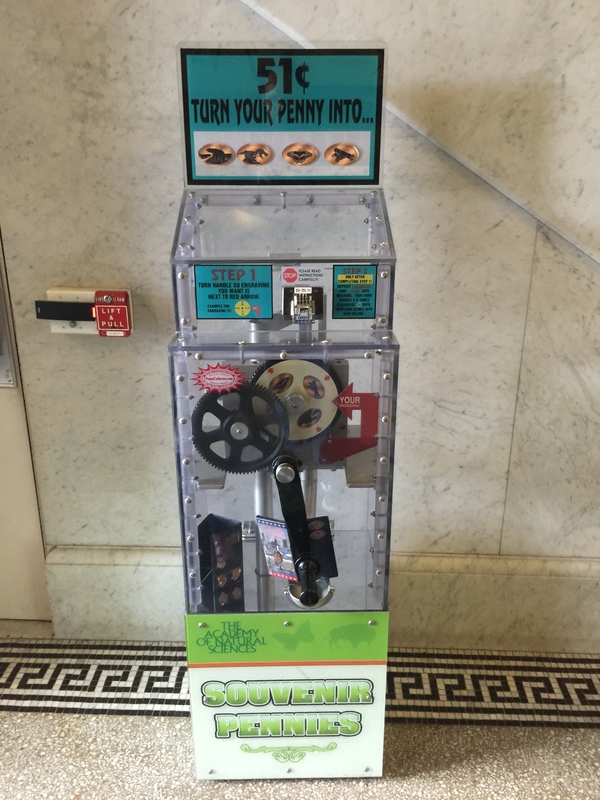 The machine pressed the coins without any issue. 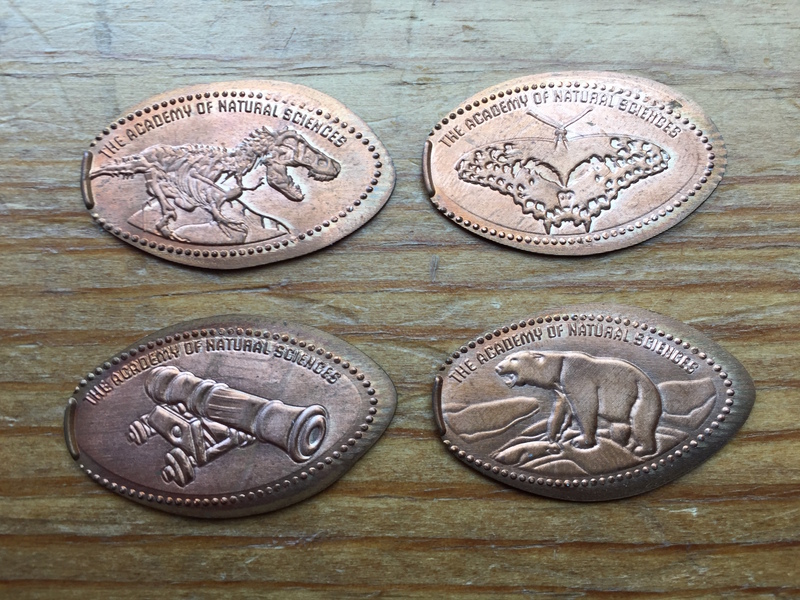 I had decided to get an updated set on nice new coins since my originals had been pressed on old crappy pennies. I managed to carry Hanna’s stroller down the front steps and back outside. We headed back over to Logan Square as it was a bit of short cut to our next destination.